I paid $13.98 for a little packet of dip nibs on eBay. Most of that amount was the $9.99 postage from Beer-Sheva, Israel. This lot attracted my attention because of the range of nib types and sizes; far more interesting than the usual tin of fifty identical needlepoint nibs. I’m hoping to use them for graphics and calligraphy. I’m testing them here on Rhodia dotPad paper with Sailor Red Brown ink. My nib holder is a glass Bortoletti pen from Venice. The first two nibs wrote a fine line (I’ve written reservoir there — I meant overfeed, which is the metal clip on top of most of the nibs, designed to hold more ink from each dip.) The Speedball is very fine, with some flex, whereas the next Speedball (A4) writes like a fat felt tip. The oblique Esterbrook Textwriter is a disaster: too wet. The next two Speedballs are nice with smoothness and flex respectively. The last is another wet one with some old dry ink caked on it. The Brause is wet but consistently so. The next two pens are designed for ruling: effectively two nibs in one. They worked well, first time. The rest of the nibs are wide italics made by William Mitchell. The Decro writes well. The others are Poster Pens marked L13, L16, L17 and L20. The L20 is 1 cm wide! It reminds me of a coal shovel. These nibs have an “underfeed” with four holes to store ink under the nib. They look like bed warmers. I shall have fun with these. Update: The “double line”/”ruling” nibs are in fact called scroll pens and are still on sale from suppliers such as Green & Stone, as is the L20 for £1.85. I’ve always loved using drawing pens, although I would often use them for my tiny writing, rather than technical design or drafting which is what they are designed for. In an earlier post (Some ink is not permanent), I compared the Staedtler pigment liner 0.05 with the Sakura Pigma Micron. The Staedtler is the one I’ve used for years; larger newsagents/stationers shops in the UK have these. The Micron 005 is typical: the tip is made of fibre encased in a metal tube. It’s easily bent by applying too much pressure. How I perceive the firmness of the tip affects my writing. If I feel it “give” then I’ll lessen the pressure on the pen a bit. Actually in the first photo there are two metal-tipped pens: the brown 0.4 is a Pilot Hi-Tec and the orange 0.38 is a Muji. Obviously one can write more confidently with a metal tip, but the line is thicker and the ink is not usually archival. It’s this permanence which has drawn me to drawing pens. Since I’m taking notebooks out and about they run the risk of getting soaked, and — without wishing to repeat too much of my earlier post — I have to tell you that gel ink completely leaches away when water percolates through the paper. There are many 0.05 drawing pens from lots of manufacturers. The actual width of the tip is about 0.4 mm just below the rounded end, and the line they leave is usually around 0.2 mm in width. I may be splitting hairs (average human hair=0.001 mm) but I think most of the manufacturers label their smallest width as 0.05, or “005” to indicate it is smaller than the 01. I got about a dozen to test and thought the best way to compare them would be to see how many words I could fit into a square inch. Look, this is just the way my mind works! First of all, my choice of paper was bad. Whitelines paper is great in many ways, but wet inks will spread a bit. I also thought my #inchquote hashtag would rule the interwebs. We have a new leader: the tiny writing of the Copic Multiliner sepia 0.05. The 10p coin shown for scale is about the same size as a US quarter, because I couldn’t find an inchworm. The sepia Copic pen retained the crown. This is getting far too exciting so here is the rundown. All these pens contain waterproof and lightfast/fade-proof pigment ink, with a plastic barrel unless stated, and they are all pretty cheap when you consider that your journals made with these could last for ever. In the UK you can find these pens at Tiger Pens, Cult Pens: Drawing Pens and Copic who sell other brands, not just Copic. Cult Pens have a Guide to Technical Drawing Pens; while JetPens in the US have a Guide to Drawing Pens and a Guide to Technical Pens. I put an absolute block on myself in September: John, do not buy any more fountain pens. I have bought seven since then, mostly by reflex or to take advantage of a good price. This is about one per month which is a big reduction in my habit anyway. It is so much easier to buy than to sell. Even the simplest eBay listing with a few photos seems to take ages to construct, but this is what I need to be doing: selling duplicates and those other pens that I might quite like, but are not my favourites. So from now on I shall do comparative reviews of more than one pen where possible to weed out the collection. Parker pens are well-known in the UK. The many hundreds of W. H. Smith shops around the country stock Parker’s low and mid-range models, hanging in blister packs from uninspiring displays. The teenage me got one as a birthday present: a heavy black Parker rollerball with gold trim, which was nice, but the clip was delicate and always getting bent out. I got it repaired a couple of times since it came with a lifetime guarantee, but the new clip was never any better so I took to wrapping the clip with thick rubber bands and then the pen got stored in a box with all my other pens and pencils. My mum lives on the south coast and told me a few years ago that the British Parker factory at Newhaven is being demolished. Now Parkers are only made in the U. S. A. and France. You see what happens when I stop buying them. Parker’s latest innovation is their 5th Technology which looks like a fountain pen but has a fibre tip. At £110 for the cheapest model it’s a gamble for buyers. The Parker 45 was introduced in 1960. Designed for the economy school market, it has a tiny nib and an innovation: ink cartridges. The story of Parker and this model, including why it was called the 45, is at the comprehensive parkerpens.net (— site found using Pennaquod). Initially all 45s had 14k gold nibs. Later, Octanium steel nibs were used on cheaper models. Production continued until 2007. I bought two Parker 45 fountain pens, both made in the U.S.A. One has a medium nib, the other a fine nib. The dark blue pen cost me £18.24, and the stainless steel pen was £14.01, including p&p, from eBay. With patience you could get a better price. Both have a friction-fit cap, a squeeze convertor and the same type of replaceable nib and feed that unscrews from the grip section. Problem no. 1 was the steel pen’s nib which did not write. I had to adjust it for flow and alignment, then polish it in accordance with the excellent Pen Habit‘s videos. Problem no. 2 was the amount of old blue ink left inside the blue pen. 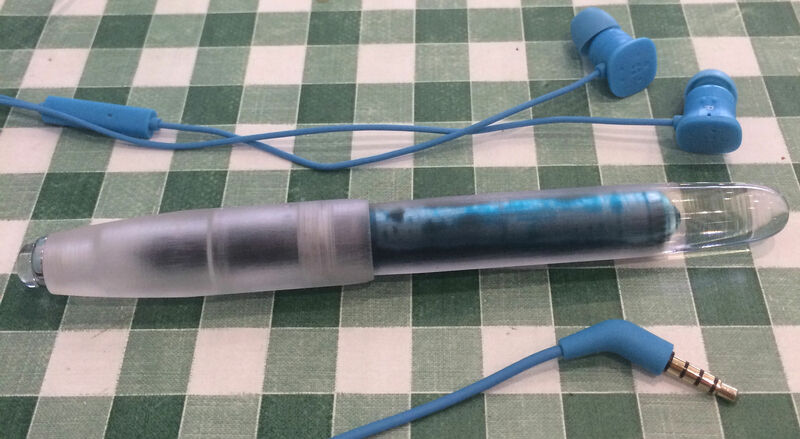 Whereas the steel pen flushed out with clean water in a few minutes, the blue pen needed a lot of work and an overnight soak before the water ran clear. Since random.org chose an orange red ink for me, I’m expecting this to turn purple during this review! Ink can sometimes be better than water at dissolving old accretions of dye. I filled both pens with Pilot Iroshizuku Fuyu-Gaki ink so I could compare them more easily. This is a really good flowing ink, performing poorly on porous paper (as found in Field Notes or Whitelines notebooks) because of feathering and bleed-through, but on denser paper like Rhodia or Tomoe River it behaves well. The colour really pops in my photos but in actuality it looks a bit darker. I would say it is similar to Diamine Coral. I like these pens. Both write smoothly and the ink flow is fine. The steel pen weighs 22g and the plastic 16g. I think I prefer the medium nib which will show off ink shading better, even though I will have to form my script larger to compensate, and I shall unscrew the medium nib and stick it in the steel body. The blue pen will go back on eBay with a fine nib. One down! Parker 45s by a six inch notebook flanked by a Senator 47, a Pilot Custom black stripe and a big old purple Lamy AL-Star. I haven’t gone into the usual detail because these are “vintage” pens that you cannot buy new—unless as new old stock (NOS)—and eBay buys and their descriptions vary in quality. Cartridge pens are usually a safer bet than piston or lever-fill pens which can need skilled maintenance, and replacement nibs can be found since this pen was common until a few years ago. If you can find a Parker 45 from a well-rated dealer then you can probably go for it. They are nice, reliable pens. Music for this review: ‘Ms. 45’ by L7 and ‘My .45’ by Holly Golightly & The Brokeoffs. Another random pairing: a 20th century pen made by the British company Platignum for the stationers W. H. Smith, paired with modern Pilot Kon-Peki ink. An unprepossessing plastic tube you might suppose, but inside is not only a converter but a broad italic nib that looks like a new Lamy nib, and it writes just as well. The pen probably only cost me a few quid about thirty-five years ago. WHS were certainly using the cube logo around 1980. (Remember these lyrics?) The Pilot Iroshizuku Kon-Peki ink looks good here on Rhodia dotPad 80 gsm paper with some shading and red sheen. Like the Lamy italic nibs, there is no tipping material but it writes smoothly. The Lamy leaves a crisper, more square, edge. These photos show a lot of defects from the plastic moulding process. This is not a high quality pen but it writes perfectly well. Weight with converter: 14 g.
I wrote this to show that I can write quite small characters with the italic nib. Kon-Peki writing sample on Tomoe River cream paper. Red sheen! W. H. Smith sell calligraphy pens to this day, now stocking the makes Berol, Manuscript, Lamy and Sheaffer. The old model I have is no longer made, however. Platignum is still around. As I have mentioned, a modern Lamy 1.5 nib fits on most of their cheaper models and will give the same results, or you could spend about £18 and get a Rotring ArtPen. Clearly I’ve kept this old pen because it’s good. The italic nib suits my style of large lettering and makes writing fun! Fixed, with a good wet flow of ink, the pen has been at my side for six months and it has been dependable. Lightweight, sturdy, reliable. What is it with all these lists? 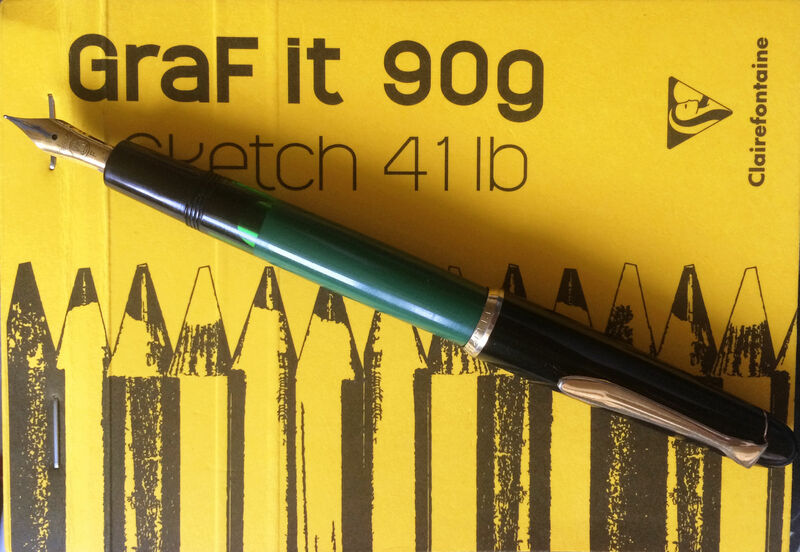 As you can see, this 82G has a dark green plastic barrel with a semi-hooded nib. 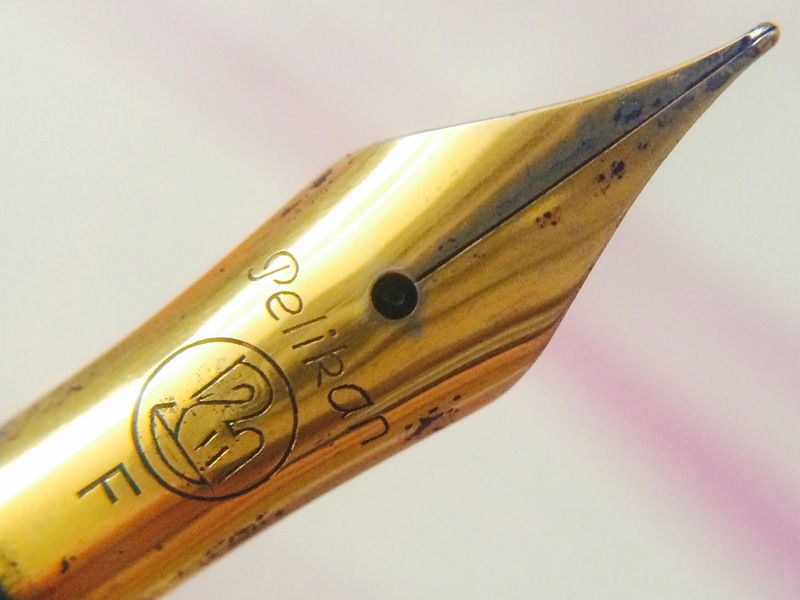 Although the nib is gold in colour, it is not marked 14K or 585 and so it is probably made of steel; gold-plated at best. The cap is formed of a thin, light metal with an inner sleeve and posts nicely onto the barrel, which is adorned with a gold-coloured finial. When not in use, the cap snuggles onto the barrel securely. Pull off, push on. Altogether with a convertor the pen weighs 14 g.
This is a vintage pen about fifty years old; another of my many eBay purchases. There is very little information online on this model. It was also available in black, blue and red. In India it was known as the Pilot Superior. What adventures we have had! Well, I usually keep the pen in my trouser pocket and thus I caught it against a doorjamb and bent the clip out. I pushed the clip back into place while gripping the top end with my teeth. This was not a good move because now there are tiny tooth marks. The M label you can see in the first photo is worn. I lost that notebook! In the first photo you can see I was plotting more Pilot pen purchases. What I do is put eBay auctions on my watchlist and record the ending price, to give me an average. Then I can use Goofbid to get a below-average price. I’ve only got this digital photo of the notebook now. The Sailor and Platinum pages are lost to me forever, along with some diary notes, and I think there was a second page of Pilot prices. Before you ask: no, I don’t know where I lost it. Ah well… I’m not buying any more pens at the moment because I have too many in boxes. My idea was to review them here, then half of them would go back on eBay, but in use they reveal their personalities and they all end up being “keepers”, so far. Lovely fountain pens. The medium nib is firm, without flex or line variation, and writes smoothly and consistently. It worked well with the Pilot Iroshizuku Murasaki-Shikibu ink. The photos are from Em’s, Cafe Fresco, Heddon’s and Coffee Culture cafés in Barnet and Enfield, North London. I hope you enjoyed the review although it could be my most unstructured yet! The landing itself was nothing. We touched upon a shelf of rock selected by the automind and left a galaxy of dreams behind. As I emerged from the reverie I saw Piloto 4 slouched among the nav screens: the shifting patterns of space largely replaced by chat windows. I made a note of it in my log. Note-taking is but one function of the Galactic, one where it excels. When you get over its space-age looks and the resemblance to the much more expensive Franklin-Christoph 02 or 66 Ice, the real utility of this pen starts to shine. At 32 g with ink it is heavy but because of its large size it feels lighter than it is. It comes with a great German nib. In use it is like a trusty needlepoint that gets grabbed when something needs to be scribbled down. I don’t even worry too much about making sure the nib is level before writing. It can handle it! No hard starts. Because of the wide girth of the grip it also reminds me of the old metal-cased marker pens of the 1960s that were similarly reliable. The pen is gorgeous. On the brushed acrylic cap is a clear polished jewel that catches light. This unscrews to allow replacement of the stiff clip. It would be great if the jewel (a pen term for any shape of material at the end of a pen) focussed on the end of the nib inside, but it doesn’t. 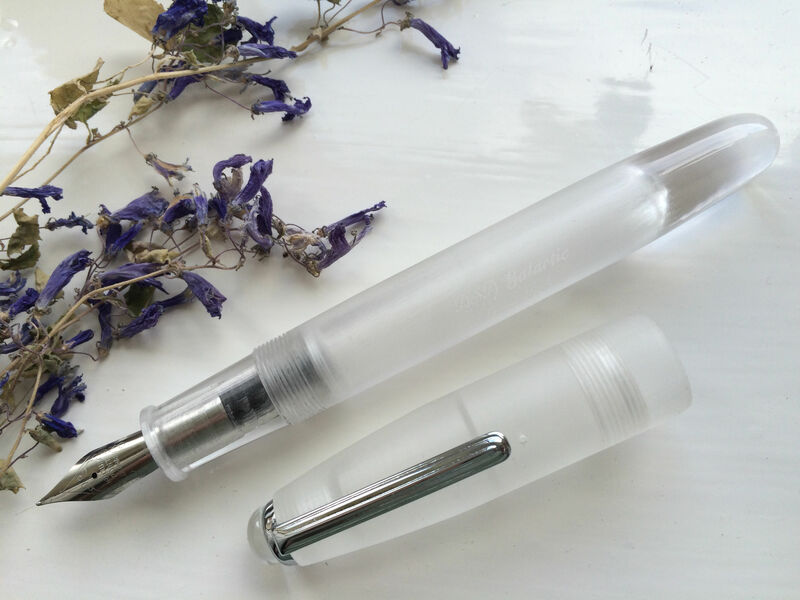 The cap also unscrews, a characteristic of more expensive fountain pens. The steel nib is firm, almost hard, with practically no line variation, but very smooth and reliable. 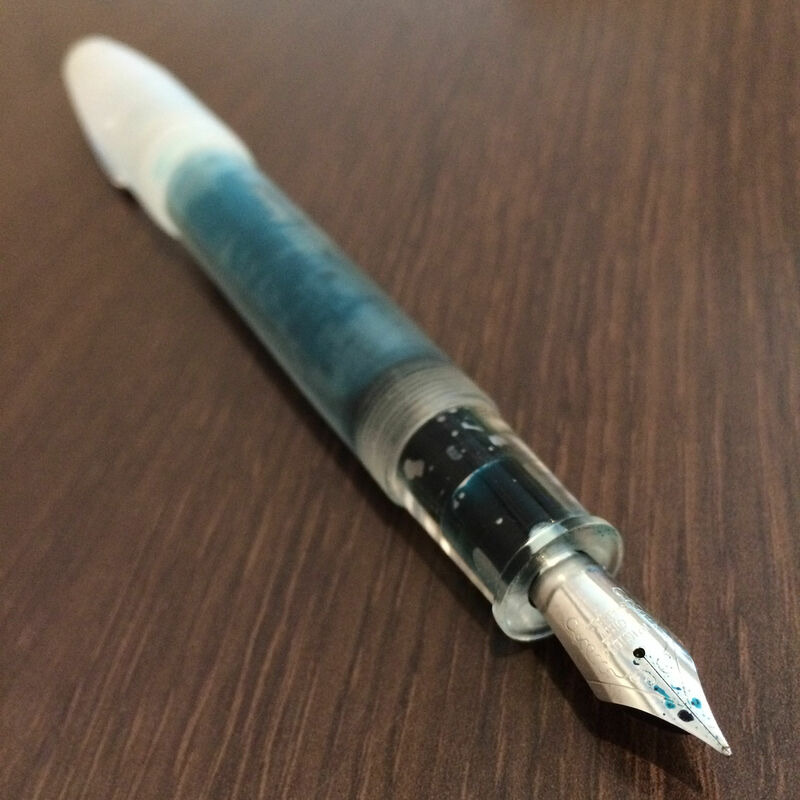 The feed is transparent so the end of the nib and the section inside can be seen, both coated with ink. This is an eyedropper pen, designed to be full of ink sloshing around and it looks pretty good with the Steel Blue ink I selected at random. It can take a lot of ink: about 4 ml. The long barrel is also brushed acrylic with a solid, polished, rounded end that looks like glass. The barrel unscrews for filling and a small eyedropper (supplied) or syringe will be needed to transfer ink from a bottle. The threads are lightly greased to keep the ink inside. The Diamine Steel Blue ink behaved well. It flows fine. But it looks green on the page! Definitely the green side of teal. There is not much shading and no sheen. Two main problems: the pen does burp a little from around the nib. Some ink, just a drop or two, will blob out and transfer to the threads of the cap and the grip section. Mostly this is when the pen is still in my discarded trousers and they are flung around but this doesn’t happen with other pens. It does not look good. The other problem for some people is going to be the thickness of the grip, exacerbated by a squared-off lip near the nib. I don’t mind the grip, in fact I can use any pen so long as the grip is not slippery, tacky, sharp-edged or brushed aluminium. I paid £20.33 for mine from AsaPens in India. They say the Galactic is the first of the ASA Stellar series. I chose the stock nib and asked that they test the pen. There is also an option for another (Jowo?) nib instead of the stock nib. The pen was supplied in a handsome black bag with golden drawstrings. Something was wrong: my hands felt clammy. I was holding the pen but it wasn’t ink on my fingers. 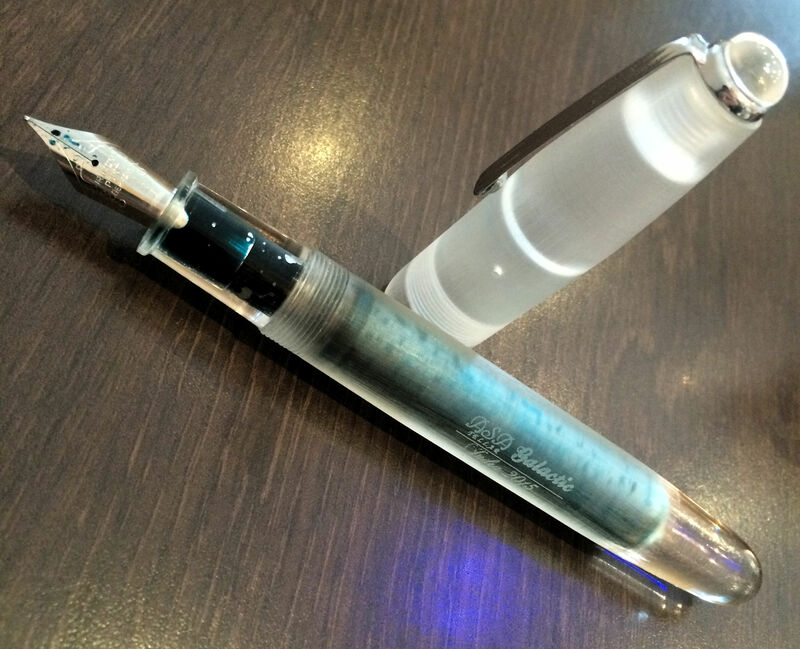 A clear liquid… it must be the silicone that Asa used to seal their pens, which could only mean – pressure drop! I turned quickly and saw the meteorite hole punched through the ship wall. Nearest to hand was Piloto 4’s spare head which sealed the breach nicely. Calvert opined they might have to give me another medal, but I knew it was the Asa Galactic that deserved the award. I hate to take you on a “journey” like every other Hollywood film or television documentary but as the events depicted in this pen and ink review are of no import whatsoever you should be fairly safe. 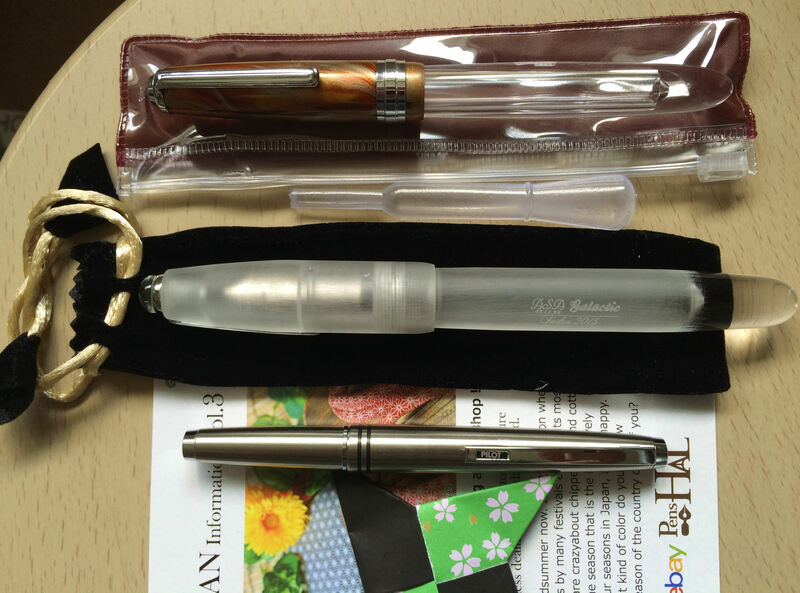 I selected pen and ink at random: the pen is a German Pelikan 120 school pen although it has the same coloration of black, green and gold as their more expensive models. The green is a solid colour without stripes or striations. 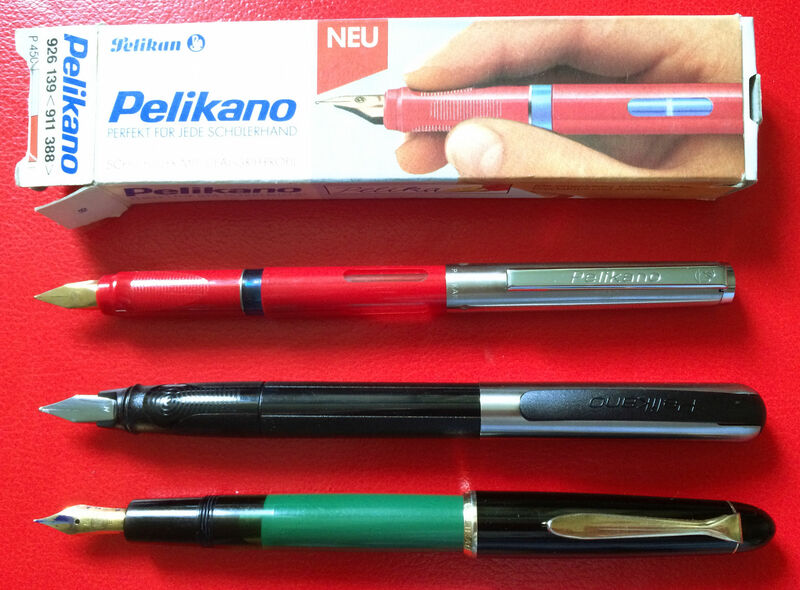 According to the excellent blog The Pelikan’s Perch, I have the 120 Mark II produced 1973-77. In this picture the 120 is shown between a Senator 47 and a Pilot G-TEC-C4. It’s light at 14g. The end of the barrel twists to move the piston. It’s a bit stiff but fully functional and on a hot day in London (no really) slippery to turn. I filled the pen without fuss or getting inky fingers. The ink window is tinted green but clearly shows the ink within. The grip section tapers towards the nib and has no lip which is unusual but works for me. Anyone who has a really low grip might find their delicate digits daubed by the long nib. The pen feels good, comfortable. Because it is light, I like it better with the cap posted. The nib is really fine, more like a Japanese fine than a German fine. 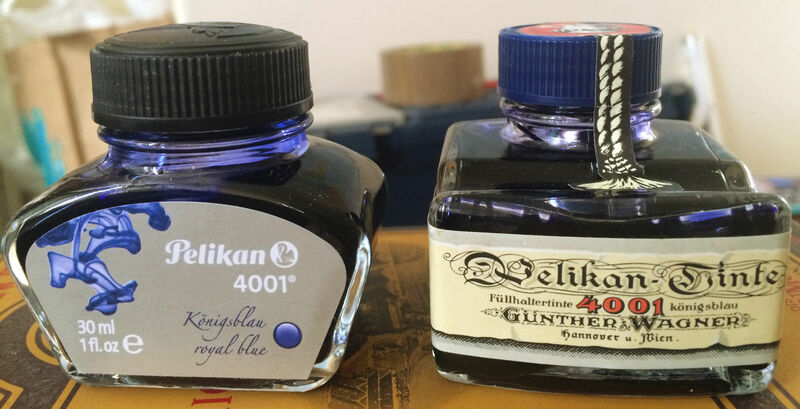 My ink is another Pelikan product: 4001 Royal Blue ink (Füllhaltertinte 4001 königsblau). I selected a bottle with gothic script on the label, which came in a gift box with another pen. This ink was a bit of wash-out. It’s more like a light blue-black colour, with a mauve tinge. As you can see this nib flexes! I can get quite wide lines with a little pressure. I shall have to be rougher with it: press harder and get wider, more legible strokes. My years of using a fountain pen at secondary school have honed my precision so that I use the minimum force of pen on paper. This nib is so fine that I might need to use only dark ink in it to make fine lines visible. There’s bite from the nib, some feedback which sounds scratchy but is not unpleasant. I have not attempted to realign the tines yet. Maybe it was the flex of the nib that drove me to spend £45.87 including postage? This was in October last year. I would look to spend around half of this price now. Granted, there are only three of these pens on eBay right now and one has just gone for £48.75 but patience is a virtue. I should have waited for a cheaper one to come along. The Pelikan’s Perch also informs me that Merz & Krell were the makers of this pen. The 120 was one of only two Pelikan models that were ever outsourced. Merz & Krell were known for their Melbi, Senator, and Diplomat pens. By a remarkable coincidence, the other pen I have in daily use, shown in the very first picture, is a Senator 47! So we have arrived at journey’s end. I paired pen and ink and then found a pair of inks, a pair of school pens and a pair of Senators. Thanks for making the trip(let).